Interview with Dr. Birgit Fritz, theatre activist, writer, Feldenkrais practitioner as well as lector for transcultural theatre work at the University of Vienna and the Innsbruck Peace Studies Programme. 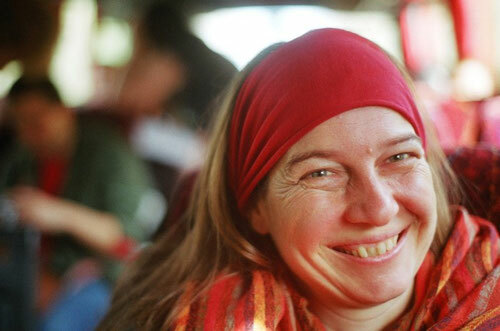 She founded the “Theatre of the Oppressed – Vienna”, the Amnesty International Theatre of the Oppressed group “SpielerAI” and recently the trans-disciplinary organization InExActArt (www.inexactart.com). Robert: Can you describe your personal path into Theater of the Oppressed and tell us where you stand now? Birgit: That is almost a spiritual question. My last book [“Von Revolution zu Autopoiese”, “From Revolution to Autopoiesis”] illustrates the journey of my private Theatre of the Oppressed [from now on “TO”] path very well. I started as a drama teacher in high school and the most complicated kids came to drama class. I used to invite different trainers, different drama pedagogues and one of them was a TO trainer. Afterwards, one girl told me that this had been the most impressive experience in all her life in that school. So I thought I want to learn how to do that. I read about Augusto Boal. I met him, followed him and learned from him. Then, I started my own theatre group, which was the Amnesty International-theatre group. I worked nationally and internationally for almost 15 years and my practice changed quite a lot. The context of the work changed quite a lot. The techniques didn’t change so much. R: In which ways did your practice change? B: I spent the last two years in isolation and gave up the theatre association I worked for in order to write about TO and analyze the practice. I kept on being a trainer on invitation but at the moment I don’t have a group. I finished my PhD-thesis, in which I investigated the roots of the Latin American revolutionary people’s theatre, which is the background of all TO. At first, TO was just a set of exercises and games to me. I was impressed because they always worked. But the more I read and investigated about it, the deeper I understood what’s behind the method. I got to know Paulo Freire better and this way, my view on TO became quite differentiated. TO is a method to initiate a process of awareness-raising [“coscientization”, “conscientização“]. You don’t only have to be able to read and write but you should also be able to understand the context, the power hierarchies and the power relations in your life that lead to your reality being as it is. TO is completely based on Paulo Freire’s pedagogy. People sometimes compare Paulo Freire and Augusto Boal but this is nonsense because Augusto Boal based his theatre on the philosophy of Paulo Freire. It’s the same concept. Boal just uses theatre as a language. So you need to read and understand Paulo Freire to be able to understand TO. My hypothesis – and the reason for my research – is that part of the history of TO got lost during Boal’s exile, that what we have been practicing in Europe is not the complete TO. I think parts of it, fragments, have never arrived in Europe. TO is context-based theatre. In order to understand what it can do we need to understand the context of its time and of the many theatre groups that tried to make people’s theatre in Latin America. So I tried to investigate into that. As a practitioner I can see that TO is wonderful because it simply works – if you understand the context or not. It works because it includes the whole person; it goes through the body and through the wisdom of the body. So furthermore, I wanted to understand more about the neurological side and somatic learning: how history is written in the body of a person. Boal also knew this type of work and even describes it in his books. He has a lot of games but doesn’t explain where they come from - which is not necessary. “We are good thieves” like Hector Aristizabal says. So, this is what I’m working with now: people and bodies. R: So if not the complete TO has arrived in Europe, what is it we practice? B: I’m going to give you a paradox answer: basically, it works in the same way but we don’t have the words to name it. The root goals of TO are very similar to other techniques that have emancipatory attitudes and approaches towards science, sociology, psychology and pedagogy. These things are important to name when we work with TO in Europe. R: How is this linked to the concept of autopoiesis? B: The autopoiesis was created by two biologists from Chile: Humberto Maturana and Francisco Varela. They found out that organisms like all life possess the capacity to reorganize themselves without the intervention from the outside. So any organism has the knowledge, the wisdom and all the resources it needs to recreate itself after destruction. On human level this would be a war. There is no society that is free from war experience; most countries know what destruction is. Maybe it happened three generations back, maybe one generation. What we need is recreation. After destruction we need some sort of healing. This is possible without intervention from outside because we cannot force anybody to heal. But we can open a space where healing is possible. Every life always has the tendency towards healing. We are not self-destructive when we are in a positive environment; a positive environment would be the absence of stress, the absence of danger, the absence of any pressure. That is the environment that we find in our workshops. R: So identity is influenced by our roots in history. In Eastern Germany we have lived various political systems and destructive wars in recent history that have left traces and wounds, which are still perceivable. What do we need to create a space to deal with unsolved events in our personal and collective history? B: The reconstruction of history is important. History, as written in history books, often is fragmentary. I have read an analysis of the history books that have been used in 2010 in Austrian schools. They are still full of racist and discriminating stuff. They talk in old terms such as “Türkenbelagerung” [“The Turkish Siege”] that never happened this way. They are full of legends and popular myths. If I held a chair in Peace Studies I’d build a team that would work on a new and crossed reading of history. If you work with “Rainbow of Desires” or “Cops in the Head” you can ask “Where do those doctrines come from?” It is possible to stop the process and question specific situations in order to continue the research. As Boal said in some interviews – and I know some people will disagree - everything can be TO as long as it follows the intention to take your history in your own hands. Latin-Americans have always been served European history. The Latin American history then has been told by Europeans. They responded that they have their own history that needs to be told in a new way, with means of arts and science. There is a great Colombian sociologist, who published books in which he processes the history of his region. On one side of the book, page A, he showed the scientific results of his researches about history how it really was. On page B, the right side, he collected stories, experiences and anecdotes of normal people…pieces of memory. They completed each other. He said that is needs to be a standard of science to have both voices. History needs to be understandable for everyone. The ones that research and the ones that are researched must have the same dignity. R: Your organization is called InExActArt – what does this mean for you? B: It’s an artistic word; an action through arts that includes the inner and the outer dimension. The name was born by accident. But working with those two dimensions is something very Boalian - going from microcosm to macrocosm. You go from the personal to the political, from the individual to the collective. The universe exists within you. That’s something you normally don’t say in order not be labeled. But Boal or Sanjoy Ganguly are very spiritual people – not because they aim sudden enlightenment but because of the strength and belief they find to follow this work throughout an entire lifetime. They are convinced of continuity and that there is something more important than individual destiny or our personal ego. You can easily find a spiritual dimension in this work. But you have to be careful with language in this context – otherwise you easily become the strange esoteric one. R: What is it you’re working on in your organization? B: The organization – which is still new and small – stands on three legs. We do traditional storytelling (narración oral – unfortunately storytelling is often used and sold to companies). The teacher is Abel Solares, a storyteller from Guatemala. Secondly we do TO or alternative theater, mainly from Latin America but also Japan. The third thing is my work with women in the Madalena groups but also with Feldenkrais to reconquer our bodies. So I have recently connected community work with storytelling, the bodywork with and for women and the popular theatre. These are the dimensions of my work. R: What do you think are the upcoming challenges for the international TO community nowadays? B: Before his death, Augusto Boal had organized a conference and unfortunately wasn’t able to experience it anymore. Many practitioners were there and for a certain time felt as if he had given us a mandate to carry on his work. Probably - as in many schools - it happened that the first generation becomes a little dogmatic when the teacher dies. That is understandable but dangerous. In the meantime, many things happened in many different corners of the world and I believe that the community has changed – it’s not a closed community with a specific task anymore but it’s transforming, throughout all continents. On one hand there is a new generation that the old ones don’t know anything about. I think a new generation of TO people is growing that we don’t know and that don’t know us. That’s exciting. It means TO is alive. We don’t have to worry. It would be nice to practice TO in the TO community in order to understand each other better. It would also be nice to have a medium of communication as we used to have. Facebook cannot do everything and I think it simply does not work. I would like to see a space like theatreoftheoppressed.org with a forum, with translations in different languages, with an archive and a newsletter…and with people from different continents that manage it and administrate it in a way that you have the feeling of democratization. I am part of the people that say that you cannot codify what TO is. It’s not easy at all to criticize it. When you see a performance in a festival you never understand the context it was made in. So I would never allow myself to say this is TO or this is not TO. Boal always said his life has become TO – because he always continued experimenting, trying, reflecting. I myself organize an annual method training. This is like a general alphabetization for me and it’s possible to cook with it and vary the recipe. You even have to. The context changes all the time. The world we live in is not anymore what we believe it to be. The means have to change. TO has to change with it. But the sense, the intention, the direction needs to stay. It’s a work that saves the dignity of human beings. R: Thank you for this interview!